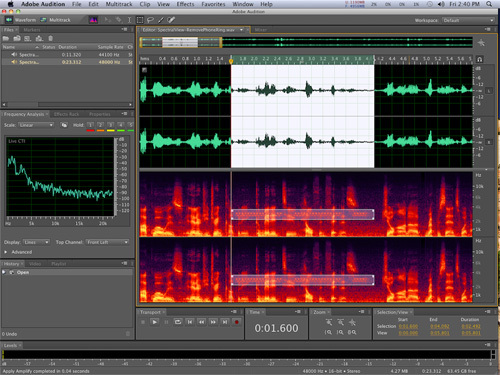 Adobe has finally made Adobe Audition for Mac OS X a reality, although there is no official release date as of yet. Earlier this month we seen a video of the software in action on a Mac, however we are just now getting word from Adobe that an official beta should be available before the end of the year. Adobe Audition is expected to a competitor for audio editing suites already available for Mac OS X including ProTools and Apple’s own Logic. Features to be included in the software include Photoshop like commands, advanced noise restoration and reduction functionality, and many DSP algorithms and processes to be in 64-bit (although the software itself runs in 32-bit). Do you really think that Adobe Audition will be able to compete with ProTools, Logic, and Final Cut Pro? Is this software still relevant to Mac users? Previous Entry: Rumor: Multitouch iOS 4-based iMacs Coming this Summer?